“Arts” is a common word for everyone in the world. We have been known about the arts since our childhood. 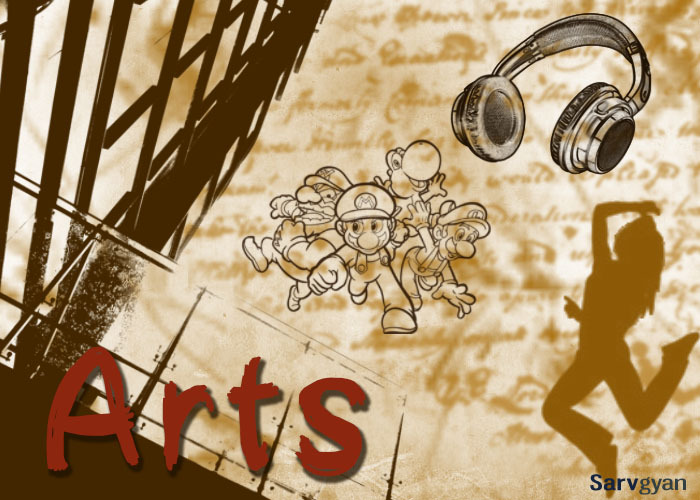 But, what is the actual meaning of “Arts”. An art is a diverse range of one’s activities. It is a human expression influenced by the culture and driven by the human impulses. It can be described as visual arts, literature arts, performing arts, decorative art and tangible arts. What can I/we do after 12 arts or what is the scope of arts after 12th? What entrance should i appear after 12th Arts? The art which we are using in our education and profession is a “contemporary form of arts”. Art contains all features and practices regarding painting & drawing, sculpture, design, weaving, fabrics, pottery, photography, films, video, computer art, animation, novels, short stories, epics, poetry, music, opera, theatre, dance and comic. Get Latest Career Notification about Arts & Humanities Courses, by entering your details below. In fine art all literature and performing act and activities have been included. In applied art the visual and decorative (architecture) practices are involved. Students who wish to do something in this field or wish to adopt this field as the career. They have so many questions regarding this field. Are you puzzled with these questions like the best diploma and degree courses available after 12th arts with or without math. It is a vast area of education, learning and job, means the good field for career. The scope of art after 12th is very bright. What to do after 12th arts, should I join computer courses or should I continue in art stream? It is one of the most asked questions by arts students. Do not worry. We are here to guide you about all above queries. All above are the core courses in the expand field of arts education. Beside these there are a lot of educational courses. Most of the time, the students ask about; After 12th Arts stream list. Some students ask questions about the courses after 12th arts merchant navy. No, there is no prospect in the merchant navy for art’s students. Delhi university offers the below courses after 12th arts. It is an essential question in the student’s mind that what are the opportunities after 12th arts. At very first, we shall have to set our mind that we need to go for the higher qualification after 12th, if we have to get a good job. Art is an innovation, creativity, design and practice to make the things valuable and incredible. The candidates who believed in these terms and having the education in this particular field have the full opportunities to find the career easily in the arts and related organizations. There are so many industries working in the field of Animation, Architecture, Design, Education, Entertainment, Fashion, Food, Material, Working, Painting, Photography, Sketch & Drawing are offering the job for the candidates who have a valid degree or skilled in the field of art and humanities. Salary is a negotiable aspect in art’s career. It depends your ability, keen witness, creativity, skills and enthusiasm and moreover the degree which you have. It has a wide range of salaries in India and abroad. In India a fresher can get the 2 to 3 lakh per Annum. In abroad you can get the $40000 to 60000 per Annum. Hello I have read your article which is very helpful, my ques is I am a Dance instructor and working in a dance academy as a instructor I like dancing but sometimes I feel it doesn’t have any future.My friends & parents say take this as a hobby not as career find a govt.job or do some professional course etc…..Should I continue my dancing with hobby or career & what course is best for me to do? In my opinion the best career is that which is your hobby. But the chance is less in this field. so carry your hobby and try to find out your career in some other interesting field. But during the passion (dance) if you would find any good platform then go ahead with your hobby. I am studying in class 12 right now in arts stream so I have a question in my mind and I am confused with this question? HOW is hotel management course after 12 and what are the scope in it and what are the careers ? Hotel industries are growing around the world. Surely it has a good career scope. you may pursue those courses in which you are interested, the best options for you will be Law, management, foreign languages etc. Hello, I’m confused about one thing that is can I do Ph.d lit. directly after 12th or I have to do B.A? No, you have to first complete your graduation..
Hi..i am tejesh and I am confused what I do after completing b.a (economics)….Now I am in 2nd yr ..so please suggest me..
My problem is that can we do phd directly after 12th or we will have to do b.a. math is mandatory for CA. Math and Science are the fundamental course for CS. First you need to have the grip over these both subject otherwise you will have to face the problems in future. In field which you have more interest. I am currently in tenth standard and I’m planning to take up humanities but I’m confused about what I want to do after I’m done with twelfth. I am particularly interested in subjects like criminology and would like to know everything about it. It’d be hugely helpful if you could guide me. criminology is the study of crimes and their investigation, after having a degree in this field you may apply for police and investigating departments, adviser to various firms etc. Hi i m deepak.i m studying in 12th class. I am interested in journalism, acting ,and anchor i am confuse that what i do next .plz sir and mam guide me..
You can pursue a course in journalism from a reputed institute. I completed my 12 (arts) and now i want to go for BCA..So is it possible that i can study BCA being from an arts background..
you must be having Maths in class 12th. sir,can i do bca after 12 arts without math? hi.. i hv done 12th with arts n i want to do carrier in media field. plz sugest me some courses..
do the journalism and mass communication graduate degree. hello sir,can i do bcs after 12 arts? hello sir, can i do BCS after 12 arts. Bachelor in company secretary? if so then yes. you must do the BA in fine arts with photography. in addition to it click on the given link. Photography course. ,hello sir I am student of mechanical engg. My intrested area is painting can I make career in.painting field? Hello sir i m confuse in my career now i m studing BA plz help me what should i do i m good in computer can i joind computer programmer plz tell me what is the bst way for me..
Yeah computer courses are mandatory now a days, you must be having basic computer skills to work in any company or organization.There are many computer oriented you can choose like web designing, database, tally, graphic designing etc. I m pursuing B.A PROG corresponding !I want to bcome a teacher so what should I do???? get the higher degree and pass the teaching programme. Hello sir, I have passed my 12th in arts. I am a handicapped. For financial problems I have a gap in my study, but I want to restart my study. I am confused that what I do next. Please please please guide me sir/ma’am. Need ur guidance. I want to do degree in sound engineering. Is this is right way? If not then tell me what I do next? Thank you..
if you do not have any problem in listening then you may go on for the sound engineering. get some entrance exam for the same and crack them with high rank. Is this right decision for me. ? Is this right decision for me? I’m studying 12 arts, and my course is about to finish. I’m very interested in music. But my parents doesn’t support me.so what is the best way for me? two ways; either listen your parents as they will decide your career or listen you. I want to become an actor. Just help me to become an actor(theatre). A B.A degree courses will be quite good for you, for the two reasons 1st you will be graduate and 2ndly you can do other short term job oriented courses side by side, like radio jockey, hospitality, or foreign lanuage or technical writing. Also if you are serious about your career ahead, you can prepare for competitive exams like banking, SSC, or you can pursue MBA after graduation etc. You should had the math subject in your 12th syllabus for appearing for the B.Tech. If so then you may get the B.tech entrance. First ensure that what subject you like very much and in what subject you are quite potential. find the way and go ahead. try for the govt job is good but equipped with for the private also. I’m very confused as to whether I should opt for arts or for medicAl, I know they both are very different from each other but I am equally good in them and love both Biology and Literature. Also, if I opt for arts,do my writing skills have scope of success? I would appreciate if you help me make my decision! Evaluate your self whether you are more potential in arts or medical. Do what in which you have a sound potential. If we talk about the career and opportunity then medical is the best than the arts. I have passed 12th and i pursuing ba from sol. Do any specialization and job oriented course in Computer. If you can then join the polytechnic diploma. I currently studying 12th arts strem ,and my Interested subject Is Economies, if I pass class 12, with marks 60 above in economics, can I join in engineering, that’s my qustion? engineering requires math, chemistry and physics subjects not economics. we are studying in 12th std right now.we are interested in geography.suggest some courses in relation with that. Do the graduation with geography simple. You have two options. one is go for the B.Sc in animation and search your career in that field or you may opt the interior designing (Art courses). Yes, you are eligible but if you have any physical deviation except than hearing problem. I am interested in studying mass communication…but after that what should I go for? What type of gaming you referring to is its computer gaming or sports? Hlllo ! Yr. Mai 12 mai hoon. Mri. Drawing achie hai. Mai eco nd pol sci m bht. Acha score kr leta hoon but. Career nai chose kr paa rha hoon. To plz koe kuch acha sa btao yr ! am intrested in arts can i go with that..
Sure, If you will go with your interest, you will get success one day. We will sure assist you but first you tell us your area of interest and your potential and the subjects what you had in 12th. Hey me khushi here me in 11 standard arts nd i m realy vry cnfused about my career I hv psychology,music,pol.sciencend fine arts.my interest is in psychology nd music plz guide me wid some career options …..
See, opportunity more matters than the package. I understand that if there is some financial prob. Both fields are having a good scope in account of opportunity and packages but as your chosen subjects HM will be better for you. banking requires accounts or finance or economics or math but you did not have theses subjects in your 12th. so keep up for the HM. Hi plz shed some light on all the aspects ofhotel management as a career for boys..
click on the link as hotel management and catering. How to be a district megistrate ? You will have to crack the civil services examination with highest rank. it is really tough but not impossible. Hello Aishter, their are many career options available in Computer science, you can do BCA if you have Maths in 12th, or you can do B.tech in CSE or B.Sc(IT) if you have PCM in 10+2, at the same time you can keep your preparation for other competitive examination like CDS, SI, SSC and Bank exams. I’m in 12 th nd my subjects are English,political,economics,hindi nd computers wd one additional subject maths…can uh Plz suggest me some career options…??? plz click on the link career after 12 in commerce. Is hacking a career in India?Please help me out to know this..and if yes,what are its requirements? Please also help me know the information about BCA course. Is maths necessary to pursue this course? Yes hacking is a good career, and you can pursue course in hacking after your BCA, or B.tech etc. The candidate should have sound knowledge in the field of computers and must be quite creative and enthusiastic to learn new techniques. i am in my 11th right now. the end of the school year is nearing and soon i’ll be giving my 12th boards. i’m really confused. i want to take up history, or maybe sociology. can someone please tell me what are my options? can i be able to get a career in interior designing even if my art and maths is not good?? Yes, of course you must be creative and hardworking to pursue this course. Dear sir I am in. 12th my subjects are Eng, Hindi, psyco, p.edu, Economics. I am totally confused what course I choose. I am interested in basket ball game. then, P.Edu will be ok for you. you may also choose the physiology. good luck. Hi I am in 11th. I am a science student but I’m finding it very difficult and I want to do arts. Can I do arts in 12th? here is an article for you. click on the link for animation. Salary is not a question for a right candidate, if you have got good skills and creativity then surely you will succeed in this field. choose your choice first. and giver the preference to your potential field. don’t be confuse. you better concentrate your study first. now you are in 11th. it will take around one and half year to become the eligible for higher study. by thinking and becoming confuse you will loose your present. over the period you will come to know your potential field. It’s good that u have realized your area of interest, but make sure before taking any step you should consult your parents and see the future career scope in the field that your are choosing, you can also consult to a career counselor for other advice related to career. i m very confuse about my career. Right now i m in class 12 ,having arts stream . My subjects r eco,political nd drawing. i want to do event management nd something which is related to political nd economics. Plz tell smthng more about event management course with some details..
Read this article here we have mentioned complete details about the course. don’t be confuse. let’s tell me your strength, your favorite subject and your area of interest in education and job field. i will guide you the better way. to choosing the B.Com is good but private? as you wish. by the way it is possible. Is bms possible after 12th arts?????? What about bcom after 12th arts? yes, you can B.Com after 12th arts but you should have any of three subjects as Accountancy, Business studies, Office Management and Secretarial Practice, Economics, Mathematics, Business Maths, Computer Science, Banking, Insurance, Marketing, Information Practice and Commerce in your 12th (arts) class. Nice information! I would like to add one more option. After 12th one can opt for liberal arts degree for graduation. It’s a 4 year full time bachelor’s degree where aspirant get exposure to lot of subjects such as – Law, Business, Media, and Language etc. Thanks for your feedback..we will surely add more courses and career options in arts and humanities after 12th. you did not mention that what subjects you have in 12th class. if you are a student of arts and you wish to do the marketing management then go with the subjects what you have. there is no any problem with arts. which one is a good choice…?? depends on your interest. dance is very competitive and hardworking field without any good platform you will have to face the problems. there are a large number of guys who have complete the HM. event management is now in good trend rather than others. so my suggestion is event management. I want to make my career in the field of computer. But i’m not good at maths. I want to do something new and different. Pllzz suggest me something. Their are many short term courses you can pursue in computer field that doesn’t require mathematical skills, some of which are Animation, web designing, tally etc. If you are looking for degree courses than you can pursue BCA or B.tech in computers. I am in 12th right now! I am interested in acting but my dancing skills is not good and money problem also! so suggest me! hey Pratik, you need to remember one thing always that “where there is a will, there is a way”. this time you are standing at the very sensitive band of your career. your one bad selection will push you in the dark and your one good decision will make you brighter in the sky high. To respect your interest is good but not give it too much time to decide. If you are interested in acting no matter how better dance you can do. So could you just tell me can I do animation ? Animation is a field that requires skills and creativity, if you have them then you can go ahead and choose some good animation institute. But again in animation you need to have good drawing skills, before animating in the computer you need to draw them by hand…but i feel with good practice you can improve your drawing and make a good career in the animation field. don’t become confused. you have many options as you have seen in the article of art and humanities course. you just need to select the path of your interest and run over that. you may choose the journalism, mass comm., animator, designer etc. Simple, select any one of the field of your interest or what you have read in our article. check our list of various courses and career options for the arts students after 12th. Weeding planning is a good field and has got good scope, weeding planning is a part of event management, so we suggest you to go for event management courses since it will have a broader scope. But if you are looking for a specialized course in wedding planning then there are some colleges that you can choose like Wedding planing EMDI Mumbai, COEM college of event and Media. can do. it is good. I m in class 12th in humanities section i m confuse what should i do after my 12th i want FD but my parents wants HM which one is suitable for me n what about sellary in both these fields?